Tours are available on a first-come, first-served basis by appointment only. Please schedule your visit at least four weeks in advance. Lessons are available Wednesday through Friday, 9 am­–3:30 pm; lessons on Saturdays and Sundays also may be available. Schools and extracurricular groups are welcome by appointment to visit on their own during regular public hours. Self-tours must be scheduled four weeks in advance by calling the Education Department. Gallery lessons with hands-on art making lessons last two hours. Gallery lessons last one hour. To help ensure a high-quality learning experience and the safety of the works of art on display, we cannot accommodate more than sixty people in a single visit. No more than thirty students will be allowed in one gallery lesson. However, larger groups can rotate between two lessons or add a supplemental activity. There must be one adult chaperone for every ten students. Additional chaperones will pay adult museum admission of $10 per person. 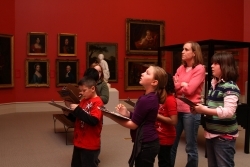 Museum lessons with an art-making activity cost $7 per student, $6 per student for a gallery lesson only. Museum lessons qualify for BOCES reimbursements; call your BOCES (Boards of Cooperative Educational Services) for information. Everyone is welcome. The museum is completely ADA compliant, and staff will do everything possible to accommodate visitors’ special needs. The museum provides learning experiences for home-schooled groups, at-risk children, classes with physically challenged students, and others. The Albany Institute does not have a lunchroom; however, special arrangements can sometimes be made for small groups. Please inquire when booking your lesson. In good weather, students may use our front lawn for a picnic. Student groups are allowed to use the concourse at the Empire State Plaza for lunch; it is two blocks east of the Albany Institute. Groups may be delivered to the front of the Albany Institute on Washington Avenue. The bus driver must stay with the bus if it remains on Washington Avenue. Buses may also pull up to the Albany Institute's north (rear) entrance in the parking lot at the corner of Dove and Elk Streets to deliver their groups. Buses cannot remain in the parking lot. If you travel by car or van, there is limited parking in the museum's lot, and plenty of on- and off-street parking is available nearby.